Managing a physician's office requires a wide range of skills. The responsibilities are broad and require detailed management of multiple processes, including the revenue cycle, compliance regulations, human resources, health information, and general business processes. Practice management can be a challenging yet rewarding profession. 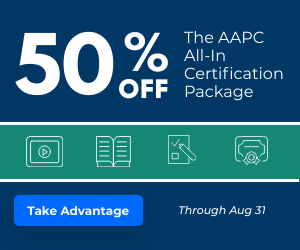 The Certified Physician Practice Manager (CPPM®) credential is a logical next step for individuals with a lot of experience in many areas of healthcare and who are ready to advance their careers into a physician practice management position. Experienced practice managers will benefit from the broadened skillset and validation of their knowledge and expertise in this profession. How Much Do CPPMs Earn? It isn't easy managing a physician's office, and the AAPC's 2017 Salary Survey proves that CPPMs make a good salary running the day to day operations and protecting its financial livelihood. the average salary for a business of healthcare professional was $52,441, a CPPM earns a managerial wage averaging at $68,153. Depending on where you live, your responsibilities, and the place of employment, a CPPM's salary will vary. Click here to calculate the average CPPM salary in your area. No manuals or references are allowed for the examination. You may bring a stand-alone calculator. All other electronic devices with an on/off switch (cell phones, smart phones, tablets, etc.) are not allowed into the examination room. Failure to comply with this policy may result in disqualification of your exam. We recommend having an associate’s degree. Each examination is separate and distinct. To obtain all certifications, each examination must be taken separately and passed. Continuing Education Unit (CEU) submissions are required for all certifications. For CEU requirements please see our CEU Information page. Have a Question? Call 877-290-0440 or have a career counselor call you.